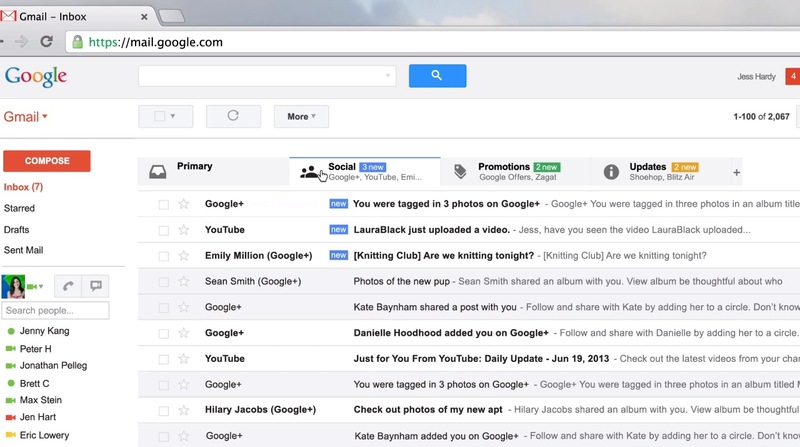 Google recently rolled out a new inbox “tab” feature to its popular email service, Gmail. This new feature intelligently sorts incoming emails into four or ore different tabs: Primary, Social, Updates and Promotions. As a default, when a Gmail user logs in they’ll land on the Primary tab and only see the emails in this tab, unless they click on one of the other tabs. The problem this creates is that your email marketing messages to Gmail users will likely lose visibility. It’s just another step that your subscribers will have to take to find your message. Also, by putting promotions all in one folder, it makes it much easier to delete them in mass. And not so surprisingly, Gmail is proving very proficient at sorting emails. In 2012, TechCrunch reported that Gmail had 425 million users. Later in 2012, GigaOM reported that Gmail is the world’s most used email service, just edging out Hotmail. However, in the United States, Gmail is the second-most used email service with a 36.7 percent market share, trailing only Yahoo, with a 40.8 percent market share. With such a big percentage of people worldwide using Gmail, a significant change to this service could have a noticeable impact on your overall email marketing efforts. However, there are a few silver linings to this story, as email marketing service AWeber points out in a recent blog. First, your subscribers will simply be able to drag your emails to the “Primary” tab, where they’ll show up from there on out. Second, it allows your subscribers to see marketing messages exactly when they are ready for them. Beforehand, if your message caught the recipient at the wrong time or was perceived to “clog up” their inbox, they might have just deleted it (or worse yet, unsubscribed). Finally, being in a different folder, your message will have less competition – well, it least it won’t be competing against messages from friends and family, or even important work-related emails (which, generally speaking, will likely take precedence over your marketing messages). It’s too soon to tell what kind of impact this will have on marketing emails across the board. That’s why it will be particularly important to watch your email marketing statistics in the coming week. The most obvious assumption is that your email open rates will go down. It’s easy to also assume that this will mean less people click on your links, less people go to your website and less people buy from you. But, that might be a stretch. The other thing that could happen is that your messages are viewed by subscribers at just the right time (when they’re ready to shop) and this correlates to higher click-through rates and higher conversion (even if your open rate goes down a bit).